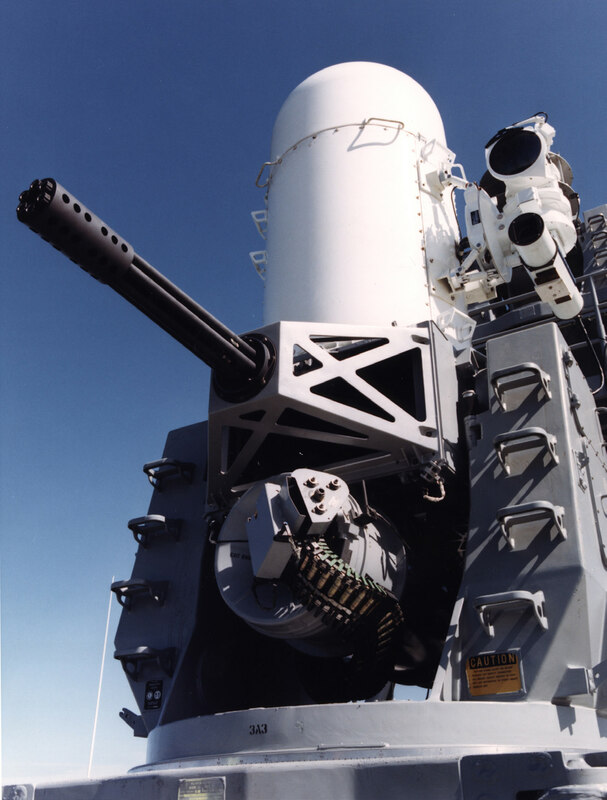 The Phalanx CIWS defends navy ships against a variety of anti-ship threats, such as anti-ship missiles and aircraft, small high-speed surface craft, helicopters and surface mines. Phalanx is the only deployed CIWS capable of autonomous search, detection, evaluation, tracking, engagement and kill-assessment functions. The Block 1B Surface Mode configuration builds on earlier capabilities with the addition of an Optimized Gun Barrel (OGB) for an improved dispersion pattern and an integrated Forward-Looking Infrared System. The new OGBs are 18 inches longer than the original M61A1 gun barrels, are substantially thicker, and include both a barrel brace and muzzle restraint to improve longevity and projectile dispersion patterns. The Enhanced Lethality Cartridge provides a 50 percent increase in penetration mass. The Phalanx FLIR provides a unique capability to search, track and engage littoral warfare threats while simultaneously providing a significant improvement in ASM engagement ranges.